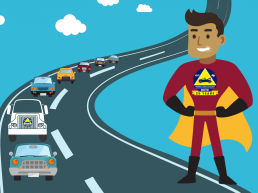 The free program offers help to stranded motorists by changing flat tires, jump-starting dead batteries, cooling overheated engines, and performing other routine mechanical repairs to help get drivers safely back on their way. They also tow vehicles to preapproved locations – all free of charge. Service will be provided during peak commute times: Monday through Friday from 5:30 a.m. to 8:30 a.m., Monday through Thursday from 2:30 p.m. to 6:30 p.m., and Friday from 12:30 p.m. to 6:30 p.m. The program marked its 25th anniversary of FSP operations on June 28. The roving tow truck operators provide an average of 40,000 “assists” per year. 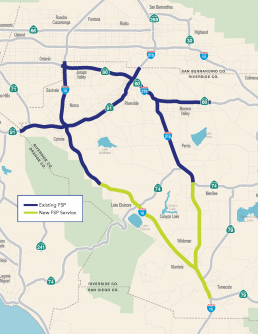 The service expansion to southwestern Riverside County this September will boost coverage to 140 miles, including sections of roadways further north on I-15, I-215, State Routes 60 and 91, and the 91 Express Lanes. For more information about the program, including a map of current and upcoming new service areas, as well as hours of operation, click here.